To reach Puntzi Lake from Williams Lake: At Williams Lake turn west onto Hwy 20. Follow Hwy 20 until you are 64 km (39.7 mi) west of Alexis Creek. Turn north off Hwy 20. Puntzi is about 11 km (6.8 mi) off the Hwy. 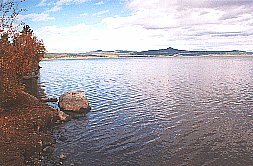 Resorts & Campsites: There are resorts situated on Puntzi Lake. All regular services and facilities are available. There is also a lightly used, open sited, BCFS campsite. Boat launch. Fishing Report: Much effort has gone into Puntzi Lake's Kokanee and Rainbow enhancement program. 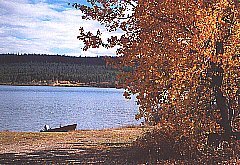 As a result, Puntzi Lake is a consistant producer of 1 1/2 lb (and better) Kokanee and Rainbow, from May through October. Fly fishing meets with good success in the early and late part of the season, while spinning and trolling gear do well all the time, and is the most popular method. Viewscape: Puntzi Lake is a plateau lake surrounded by low rolling mountains. The soil is sandy with Lodgepole Pine forest. Shoreline: Puntzi has a rocky shoreline with low overhanging Alder trees. Marsh grass and bullrushes are found in some areas.